I’m a full-time blogger… Meaning, I make a full-time income at home writing posts like the one you're reading. In fact, I make more from the blog than I ever did from my previous career. I'm making just shy of $7,000/month with the blog. I won’t lie. It’s a pretty awesome job. I get to help people every single day and I get to stay home with my family while I do it. I can work in my pajamas, in bed, on the deck, at the park, on vacation, or even at the local Starbucks. One of the most frequent comments I get when I tell people what I do for a living is… You must be great with computers. It makes me chuckle every time. Nope. I’m not great with computers. Sure, I know the basics… mouse, keyboard, how to get to Google, etc. And of course, I’ve learned a ton since I started blogging, but I was awful with computers when I started blogging and my eyes still glaze over everytime someone mentions HTML. It’s just not for me. And it didn't take me years to learn enough to make a living at this. I reached full-time income with the blog within 12 months of starting it. But, If you love to write and you love to help people, blogging is one of the best jobs in the world. It's also one of the only businesses that you don't need to invest major money in to start up… You invest your time instead. If this sounds like the perfect gig for you, I'm happy to tell you that your lack of computer skills won't be an issue. I can help you get around that! What's the easiest way to start a blog if you aren’t great with computers? Thanks to modern technology, it’s actually pretty easy! 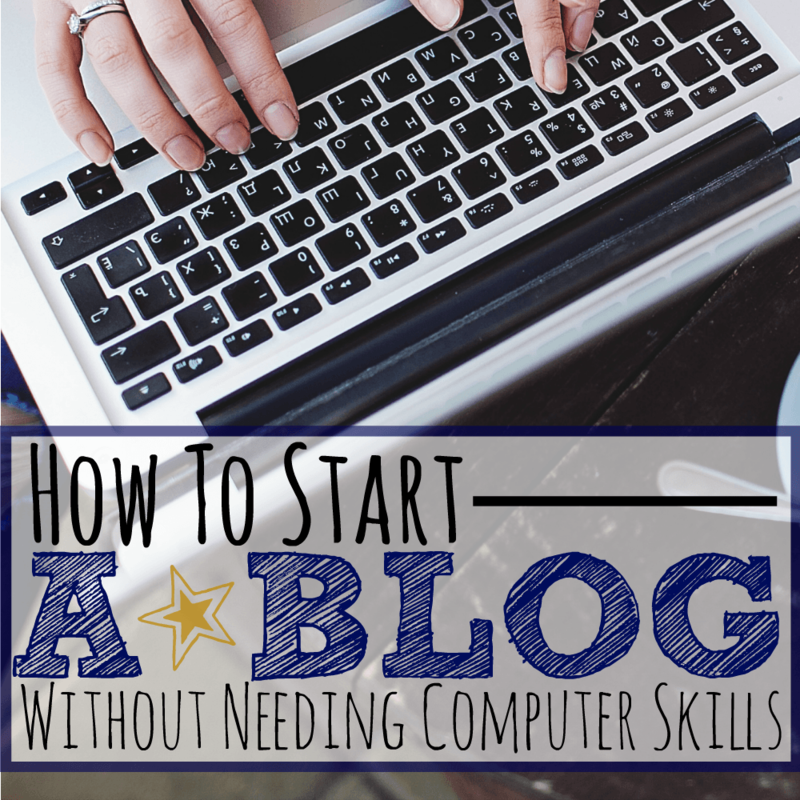 I’ll run through the entire process and give you a step by step guide to having your own blog. I warn you: This is long! It’s meant to walk you through the whole process, bookmark it and come back as you complete each step. Decide on your end goal: Money or Pleasure. What do you want the end result of your blog to be? Money or pleasure? You can absolutely do both and your main goal should always be to help people, but if you're just looking to create a blog to chronicle your life for friends and family, I can send you over to Blogger but that's about it. That's not really my specialty. If you want your blog to make money (even if you're also blogging for pleasure) than you need to be self-hosted on wordpress. If you have no idea what that means- Fear not, I'll walk you through it. Self-hosted means that you own your website. When you blog on a free platform like Blogger, you don't really have control over your blog. Blogger (or whatever free platform you use) sets the rules that you have to follow and those rules severly limit your ability to earn money on your blog. If you want to make money, you need to be self hosted. I'm going to walk you through exactly how to do that. You should know up front that you'll need to spend about $15 upfront to buy your domain name (your “address”) and then about $3.49/month to “host” your site. That's the only amount of money that you would need to put into your blog before you start making money. Determine your niche: What do you want to write about? My best advice is to write about something that you can’t shut up about. A topic that you could just talk to your friends for hours about. It should also be something that you're good at. If you’re a success story of what you want to write about- Even better! There is literally successful blogs on almost every topic. The easiest blogs (in my opinion) to monetize (meaning you make money as you help people on your blog) are topics that let you solve problems. That can really be adapted to almost every niche though. A word of caution: photography is almost a required skill in the niches of food and crafts because you won’t have the option of using stock photography for your own creations. There are certainly ways to get around that (hiring someone to take photos is one) however they’re expensive and unless you're willing to put money into this before you make money, I would steer clear of those niches. Grab a paper and brainstorm every word you can think of that decribes what you want to blog about. The main niches are: lifestyle, fitness, food, money, travel, and parenting. 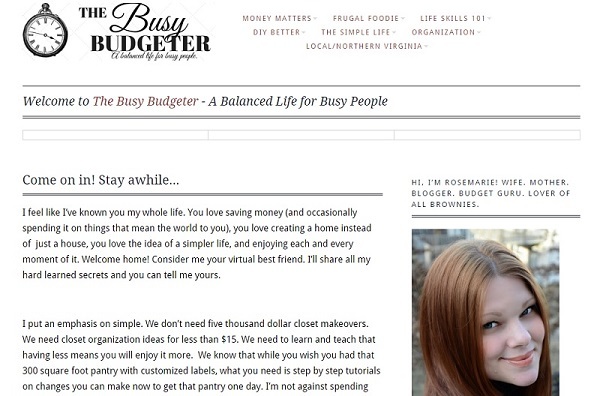 I knew I wanted to teach people about time management, budgeting, and saving money so my list had words like budget, budgeting, busy, money saving, finances, financial, schedule, skills, calculator, and family. Literally list all of the words that remind you of your topic and then start combining them to form blog names “financial schedule, family skills, family money, and busy budgeting family”. Keep in mind, I simplified this for you. My original list was a full page of words. Head here to enter your favorite blog names into the search bar to see if the name is already taken. You really want a .com address. Meaning if you want the blog name RowdyRadishes.com and it's already taken, they're going to tell you that you can buy RowyRadishes.net or RowdyRadishes.info – Don't do that! Keep searching until you find a name that you love that has the .com available. Fun fact: Finding your name is often the most frustrating part of blogging. I almost pulled my hair out. It takes a while to find a name you love that isn't already taken. Make sure to run the name by friends and family before you buy. I was so excited by the blog name “The Prudent Provider” until my friends said that it made me sound old and weird. Kim from Thrifty Little Mom, chose the name Little Mommy Secrets until she realized that it kind of sounded like an adult website. Once you find your name and the domain name is available, buy it! A domain name should be about $15/year. Occasionally you'll see a Domain name with a crazy price tag (like $2,999). That means that someone bought that domain name and is sitting on it in order to sell it for a profit. You can just ignore that one and keep searching. Get hosting for your blog. Hosting is a company that actually puts your website out into the world. Your host has a computer running 24/7 that your blog is run off of. I'm sure it's more complicated than that… but that's about all that I needed to know. There are lots of different hosting options, but 3 that I think you should consider. My best recommendation is Bluehost– I love how easy Bluehost was to set up and use! They are the perfect host for someone that isn't great with technology. I could just call them and tell them what I needed and they would walk me through it, or do it manually on their end. You can get Bluehost for about $3.49/month through this discounted link. CAUTION: Bluehost charges yearly! So even at $3.49/month you'll need to pay for the full year. If you have a ton of expendable income and really want to “go big or go home”, you can look into WPEngine, but while that's considered to be “the best of the best”, I think they’re way too expensive for someone starting out. Their plans start at $29/month. Personally, I'd stick with Bluehost. The absolute cheapest host is GoDaddy. I don’t recommend them at all. But if you don’t care about the customer service and ease of use, then this can be a budget option. It's better than nothing and you can upgrade when you grow. GoDaddy plans start at $6.99/month but you can pay monthly so you don't need to pay for a year upfront. (Warning- On their sales page, they often show discounts- those are only available if you pay for a full year- if you're going to do that- go with Bluehost instead- It's much better and cheaper when you're paying annually as long as you use my Bluehost discounted link). Get WordPress for your blog. You can get wordpress here, Then you need to activate it on your host. This is as easy as flipping a switch. If you need help- Just call Bluehost and they can do it manually (assuming you have hosting with Bluehost). Now you have a “blog” but there’s nothing actually on it. It's just a blank website. We need to choose a theme now. A theme makes it so that when people go to your “address” (your website), they actually see something other than a blank screen. Choose a theme for your blog. A theme determines how your website will look with minimal knowledge from you pick will automatically do all the “techy stuff” so that your website displays a certain way. Your goal is to earn enough blogging to pay for a professional website design quickly so don't go nuts on your theme. Free: You can just use the free themes that come in your WordPress dashboard. There are a few to choose from. They're extremely basic, but it's an easy way to get by until you start making some ad money. Basic: I spent $49 on the Cotton Theme when I first started The Busy Budgeter. It worked well and got me enough income to afford a site redesign. Themes are hard to recommend because you may want your site to look different from mine. Best: The standard for professional bloggers is a Genesis Framework and a child theme (they work together- you need them both). You buy these themes through StudioPress together starting at about $99. If you have the extra money, this is a great use of it but don't stress out if you need to go the basic or free route. The goal is always to get a professional design as quickly as possible. Create a logo for your blog. Now you have your theme, I want you to create a logo. There are a few options here. You can play around and create one on Canva for free. This is technically called graphic design. Don't stress if you don't know what you're doing. I certainly didn't! You get better over time. Sticking with just words is going to be easier than trying to design a fancy logo. Again, your logo will change when you earn enough from blogging to get the site redesign (and YES! If you stick with this, you will earn more than enough for a site redesign!) I recorded a video to show you step by step how to create a logo in Canva. If you’re not up for doing it yourself, You can go to Fiverr and pay someone $5 to create a logo for you. I'll warn you that for $5 this won’t be a professional amazing logo. Some people get lucky and end up with logos that they love, most people end up with something that you can live with until you can get a site redesign, some people end up with a logo my 3 year old could have designed. Personally, I wouldn’t spend more than the $5 at this point (I’m assuming you don’t want to put money into this until your making money) because the goal is to earn enough for a site redesign quickly. Once you redesign the site, You’ll get a new logo as well. Start writing on your blog! I made a video to give you a quick walk through of your dashboard but most of this you can probably figure out on your own. This is basically a fancy way of saying “adding photos”. My best advice is that unless you’re an amazing photographer with extra time, stick to stock photography. The best place for free stock photography is Pixabay. Here’s a more exhaustive list, but I pretty much exclusively used Pixabay until I could afford to pay for a membership. I have a really easy step-by-step tutorial on how to create great graphics with almost no skill here. You can follow those steps and add them to your blog. Boom! You have a blog! Now you need to work on monetizing it. I’m going to set you up on the right course. Making money from your blog. Start with a copy of How to Blog for Profit Without Selling your Soul by Ruth Soukup. Study it. Highlight. Make it your new best friend. Your goal here is to make enough to afford Elite Blog Academy. Elite Blog Academy is only available during certain times (about two weeks per year). It will teach you everything you need to make this a full-time gig as quickly as possible (It took me less than a year of doing this between 10-20 hours a week to go full-time). Many of my classmates in Elite Blog Academy had the same results, some even quicker. It’s going to require some hustle muscle, but you can do this. You need to have at minimum 10 hours a week to devote to the class and you need to be committed to doing this. Advanced tip for when you go full-time. If you never get good at computers, don't stress. Once you’re making a regular income, just hire someone to handle the things you can't do. I spend $99/month on Grayson Bell of iMark Interactive and it’s the BEST money I spend every month. He takes care of everything I don’t understand. Things that I used to waste hours trying to figure out, now I just jot him a quick note and he does it for me. Besides being a tech genius, he's a mind reader. Yesterday, I send him an email that read: “My designer said she can’t update that ad because something (css csd? I don’t really know) isn’t updating right (or something?) Any thoughts”. He knew exactly what I meant. Seriously. He turns things like that into a solution. The path that I took to blogging full-time. Here’s the path that I took, and I would recommend it to anyone. I hear a lot that I “have great business sense” and while I’m not putting myself down, I can tell you with certainty that no one in my life (including myself) thought that I had “great business sense” before the blog. So, if you don’t think that you can do this… I would beg to differ. I’m really not special. I did everything that I just told you about and I gave myself one year. One year to sacrifice and treat those 10 hours a week that I spent blogging as my job. Every single cent that I made from the blog until I was making more than $1,000/month went right back into the blog. The only thing I purchased up front was my domain name, hosting, and theme. Then I used my profits to buy the things that would make the biggest difference to my income. Tons of training! Even now, I invest back into my business. I find the experts in whatever skill I need to get better at and pay for a step-by-step instructional course to teach me what they know. Everything from time management to writing skills, business skills, marketing etc. If you want to know what's working for me and what’s not, The best way to do that is to join my bloggers newsletter list. I'll send you my free quick growth resource guide for bloggers as well as my income report every month. You can join the blogger newsletter by entering your email below. I'll send you an email with your free guide immediately. That's the longest post I've ever written! Go start a blog, then come back and leave your blog link in the comments! What's your new blog about?